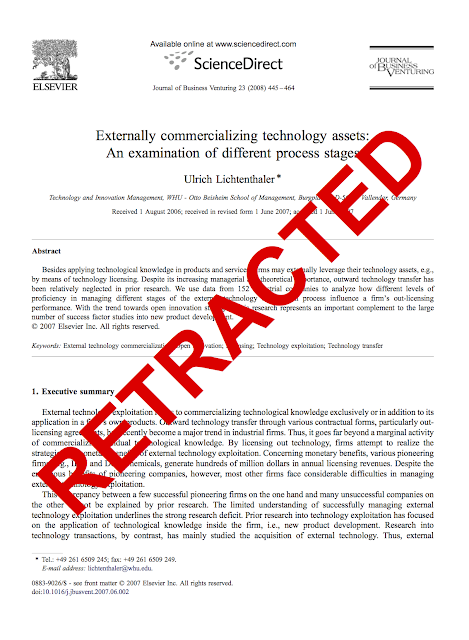 The article “Not-Sold-Here: How Attitudes Influence External Knowledge Exploitation” (Organization Science (2010) 21(5):1054–1071, DOI: 10.1287/orsc.1090.0499) is being retracted after an assessment that the work violates INFORMS publication standards in two important respects. First, the citation to highly related prior work by the first two authors is quite incomplete. As a result, it was not possible to assess the novelty of the work. In addition, there is reason to believe that key results in the paper would not hold if variables included in this related work had been incorporated into the analysis. According to the acknowledgements, the 2010 article by Lichtenthaler, Ernst and Hoegl was presented at the 2006 Academy of Management conference and accept by OS editor Linda Argote. Below is the complete list of retracted articles to date.